OMG indeed, if you didn’t see the tweet by David Davis or Scott Lowe (aka OtherScottLowe) they are doing a vendor neutral webinar on vSAN as well as Hyperconvergence and the Datacenter of the Future. January 30th, 2014 – 2:00pm – 3:00pm EST Even while in beta, VSAN has become an overnight sensation thanks to its promise to eliminate the SAN from the data center. But, VSAN is hardly a silver bullet when compared to offerings from Nutanix, SimpliVity, and Scale Computing. This free webinar is a must for CIOs, Virtualization Administrators, Storage Admins & IT operations managers. 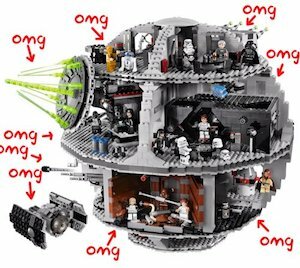 So not only will you get some great information, you might get a chance to win your very own Deathstar. Scott wrote a really excellent piece on the Hyperconverged space for Wikibon a few weeks back that I would highly suggest reading if you are looking at where the datacenter is headed in the future. Its always good to see all the options that are being promoted in the marketplace and then making informed decisions. As always if any of my readers have any questions around what SimpliVity is offering, feel free to ping me. If you want a jumpstart on what SimpliVIty is doing in this space with, check out our Tech Field Day presentation from VMworld 2013.